While many home and professional kitchens have a deep fat fryer for frying, it isn’t an essential piece of equipment – all you need is a frying pan, some cooking oil and a slotted spoon. A kitchen thermometer is very useful when trying to control the temperature of the oil but, again, not essential. The best oils to use for deep-frying are flavourless with high smoking points, for example, sunflower, groundnut and vegetable oil. Using a slotted spoon, carefully immerse the ingredient in the oil and cook as per instructions. For safety reasons, never leave a pan of hot oil unattended. 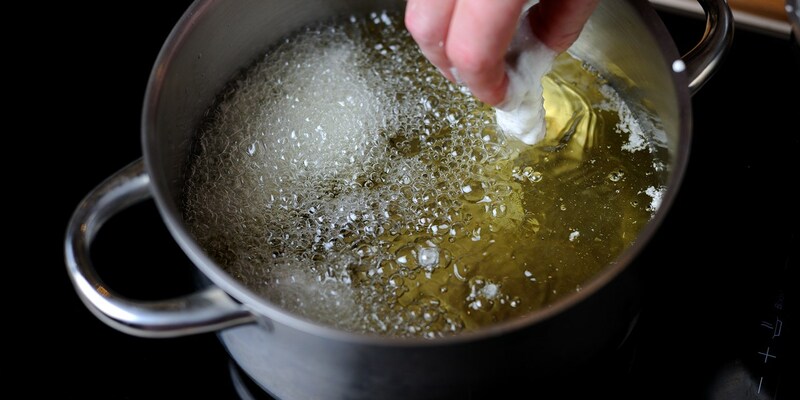 Make sure the ingredients you are deep-frying are completely dry before immersing in the oil – any residual liquid will cause the oil to splatter which is dangerous. Always deep-fry in small batches and lower the ingredients into the oil carefully.